£1 Off Term Time Bookings at Manor Farm Park & Woodlands Book Tuesday to Friday and save £1! Manor Farm opened to the public in 1994 and has developed a range of child focused activities to get youngsters learning more about the natural world around them. Kids can come and learn where eggs come from, the differences between ducks and chicks and all sorts of woodland crafts and skills. They can explore the woodlands, lakes and meadows as well as interacting with the Manor Farm animals. Many of their animals have been rescued and all are given the best possible standards of care. Manor Farm has a treasure trove of special stories about their blind goose, toothless goat and rescue donkeys to name a few! They have also introduced children’s parties where kids can explore the farm, activities and woods for an extra special celebration. They can even climb aboard the pirate ship, race the Pedal-Karts or enjoy a donkey ride for an unforgettable birthday. The added indoor play areas mean Manor Farm is a great attraction all year round. How do I use my Manor Farm voucher? If you’re a frequent Manor Farm visitor you could save money by becoming a Friend of Manor Farm. Get unlimited entry for 12 months at great prices! Is there disability access to Manor Farm? It is advised to call ahead to ensure the best possible experience for users with access needs. How do I get to Manor Farm? Manor Farm is in East Leake, Loughborough, LE12 6LU. East Leake is on No. 1 bus route from Nottingham to Loughborough. East Leake rail station is between Loughborough and East Midlands Parkway. Do I need to book Manor Farm tickets in advance? Not at all, though tickets can be booked by phone. 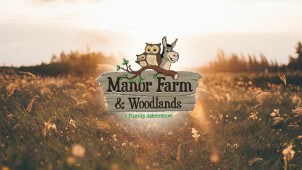 If you’re looking to get the kids away from the telly then a trip to Manor Farm is just the ticket, and with a Manor Farm voucher your day out could save money, too. Come and see the rescue donkeys, owl sanctuary and famous llamas, take in a nature trail in the local woodland or let your kids loose in the adventure play areas. You’re sure of an action packed day for the family at Manor Farm! Many of Manor Farm’s animals are available for adoption. As a non-working farm, they don’t breed their animals and the farm exists strictly to look after these beloved creatures. Choose from donkeys, ponies and llamas to pigs, rabbits and owls. Adoption schemes range from Bronze Packages to Gold Packages and could earn you free passes to come and visit. Your kids can get involved with animals from an early age and get a certificate to prove it! Manor Farm puts on some amazing events during the year. You and your family could enjoy the special activities for even less with the help of a Manor Farm discount code from vouchercloud. Whether it’s pirate fun days full of dressing up and storytelling, Easter chocolate hunts with chocolate eggs hidden at every turn or willow craft days where the kids can learn some amazing new skills, the Manor Farm events are not to be missed.